Background: Cancer is a generic term for a large group of diseases that can affect any part of the body. Other terms used are malignant tumors and neoplasms. Fine-needle aspiration cytology (FNAC) has been extensively used for many years in the diagnosis of cancers, especially breast cancers, but its use has gradually been reduced in some hospitals because of its controversial inadequate rates and suboptimal accuracy in inexperienced hands and in some cases conflicting reports when compared with the excised biopsy of the same lesion. This is a prospective study to correlate the cytological findings in patients diagnosed with cancer with the histological diagnosis on excision. Materials and Methods: This was a prospective study of 30 patients that attended the Department of Pathology, Federal Medical Centre, Birnin Kebbi, from July 2016 to June 2017. All patients who were diagnosed after FNAC as having a malignant lesion were followed up for surgery for their excision biopsy. FNAC of the 30 patients was performed using 23-gauge needle under direct palpation (27 cases) by the pathologist and by ultrasonographic guidance (3 cases) before the surgical excision. Specimen after excision was fixed in 10% buffered formalin and stained with routine hematoxylin and eosin. Diagnosis on FNAC was subsequently compared with diagnosis after excision. Immunohistochemistry studies using limited antibody panels (CD5, CD10, CD20, CD30, and Bcl-2) were used on some surgical tissues (mostly lymphoid tissues) using Genemed biotechnology protocol to arrive at a definitive diagnosis. Results: A total of 30 patients had FNAC of various cancers during the study period, and all patients had excision biopsy subsequently. The age range was 5–65 years, with the most common sites of FNAC been the breast 17 (56.7%), abdomen 5 (16.5%), and cervical lymph nodes 4 (13.3%). There was 100% concordance between the diagnosis on FNAC and the excised tissues. Conclusion: FNAC correlates very well with histology of the excised tissues and remains a useful tool to guide the clinician for better management of patients. Cancer is one of the leading causes of morbidity and mortality worldwide, with approximately 14 million new cases in 2012. Cancer is the second leading cause of death globally behind cardiovascular disease and was responsible for 8.8 million deaths in 2015. Approximately 70% of deaths from cancer occur in low- and middle-income countries. Late-stage presentation and inaccessible diagnosis and treatment are common., Much of the world's burden of cancer is in poor and developing countries, where there are often very limited screening measures, early diagnosis, and treatment facilities. There is a growing awareness that significant investment in cancer control measures is required to reduce the burden and suffering in low-resource settings. In 2015, only 35% of low-income countries reported having pathology services generally available in the public sector. More than 90% of high-income countries reported that treatment services are available compared to <30% of low-income countries. Fine-needle aspiration cytology (FNAC) has been extensively used for many years in the diagnosis of cancers because it is simple, safe, economical, and accurate. Previously, the role of FNAC has been challenged by results obtained with core needle biopsy (CNB) that seems more robust than FNAC. In some settings, CNB is now preferred in the first line of diagnosis. 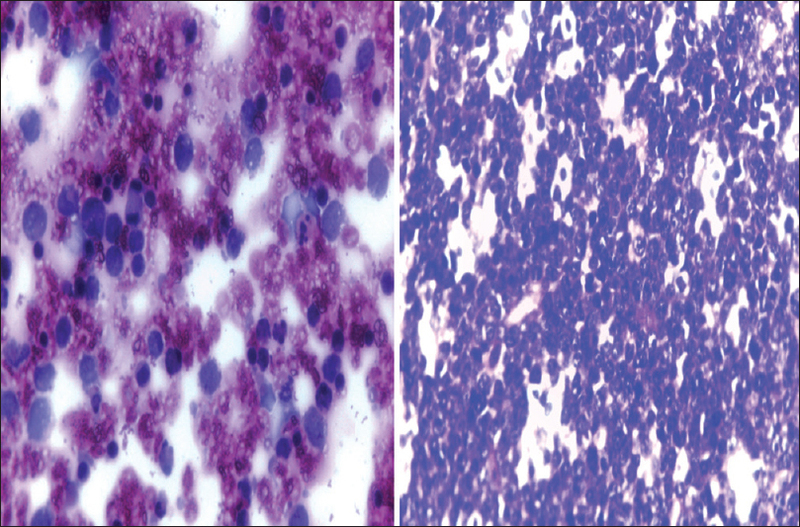 These last years, a new cytological technique, called liquid-based cytology (LBC), has evolved. LBC standardizes the cell fixation, concentrates epithelial cells, and discards blood cells and/or cell debris that obscure the smear. In a resource-limited setting such as ours, conventional cytological methods are readily available in most centers and give high diagnostic accuracy. The objective of this study is to do a cytological (FNAC) and histological correlation in patients diagnosed with cancer using conventional cytology methods and where possible use immunohistochemistry on biopsied tissue to arrive at a final diagnosis. This was a prospective study that included FNAC patients who subsequently had surgical excision in the Department of Pathology, Federal Medical Centre, Birnin Kebbi, between July 2016 and June 2017. 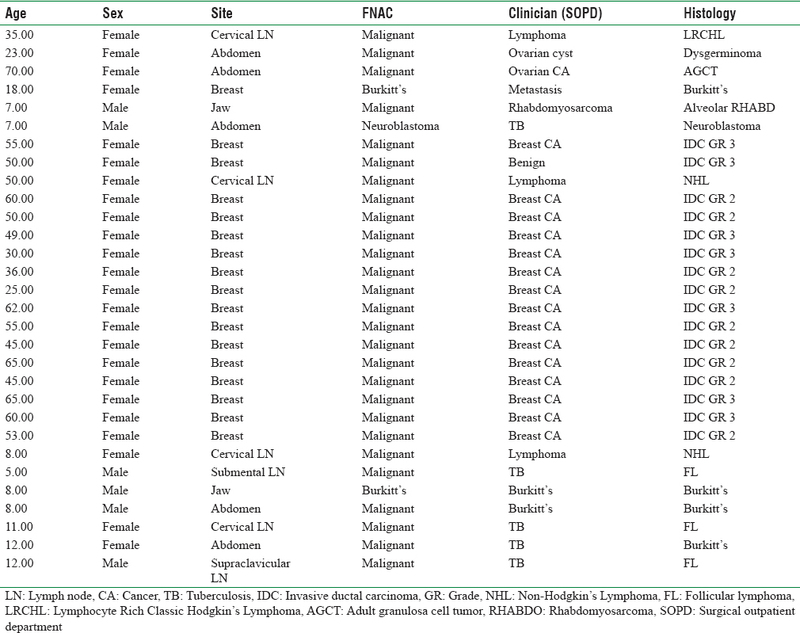 A total of 150 patients with various cancers had FNAC of which 30 subsequently had biopsy. FNAC was performed for all the cases using 23G needle attached to 20 mL disposable syringe smeared on labeled frosted microscope glass slides fixed with 95% alcohol and stained with Papanicolaou, Giemsa, and hematoxylin and eosin (H and E) stains. Those patients who had excision biopsies had their specimen fixed in 10% buffered formalin, and sections were cut and stained with H and E. Cytology results were compared with final histology for correlation [Figure 1]. Results were also compared with the clinician (surgical outpatient department) initial diagnosis before FNAC [Figure 2]. In some cases, immunohistochemical stains were applied on the tissue biopsy using Genemed biotechnology protocol to arrive at a diagnosis. 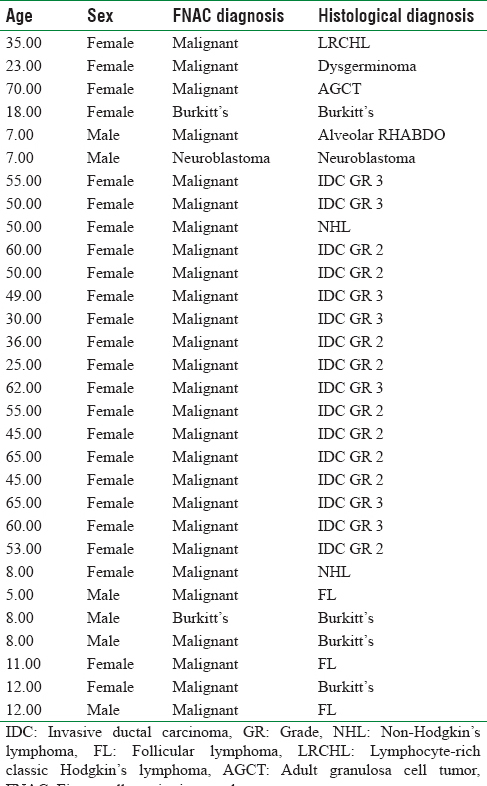 Immunohistochemical panel used in this study included CD5, CD10, CD20, CD30, and Bcl-2. Data were analyzed using SPSS version 20. Fisher's exact test was used to study the association between variables with level of significance at P ≤ 0.05. A total of 30 patients had FNAC and subsequent excision biopsy of the same lesion. The age range of patients was 5–65 years with a mean of 35.97 and a SD of 21.99. The most common site for FNAC was the breast 17 (56.7%), followed by the abdomen 5 (16.6%) and cervical lymph node 4 (0.13%). 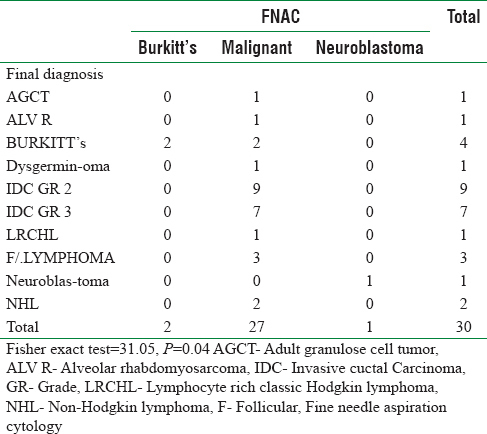 Most cases were reported as malignant lesions with three cases reported on FNAC as Burkitt's lymphoma (2 cases) and neuroblastoma which presented as a suprarenal mass and sampled under ultrasound guidance. All breast lesions on FNAC were reported as malignant (C5). Correlation of cytology and histology diagnosis as shown in [Table 1] with 100% accuracy recorded. All FNACs from the breast were diagnosed malignant (C5) with subsequent mastectomy showing all cases to be invasive ductal carcinoma which were graded [Figure 3]. 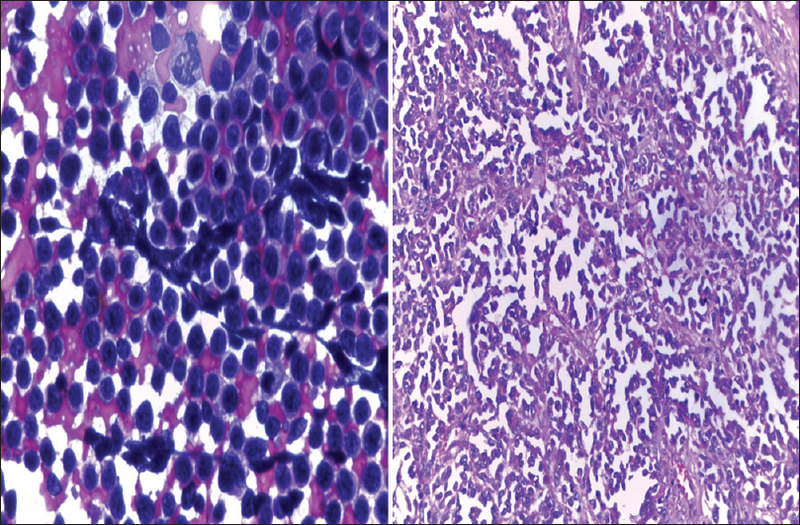 Two cases of Burkitt's lymphoma and a case of neuroblastoma were diagnosed based on their cytomorphology which correlates perfectly with the diagnosis on excised tissue biopsies [Figure 1] and [Figure 2]. Immunohistochemistry was performed on all cases of lymphoma. Pediatric follicular lymphoma was common (3 cases) which was positive for CD20 and Bcl-2. A single lymph node on FNAC showed few diagnostic Hodgkin Reed–Sternberg on a background of numerous lymphocytes, and on immunohistochemical staining, it was positive for CD30 and negative for CD5, CD20, and Bcl-2, hence diagnosed as lymphocyte-rich classic Hodgkin's lymphoma was made [Figure 4]. Two lymphomas could not be further characterized based on the limited immunohistochemical panels; however, they were released as non-Hodgkin's lymphoma (high grade). 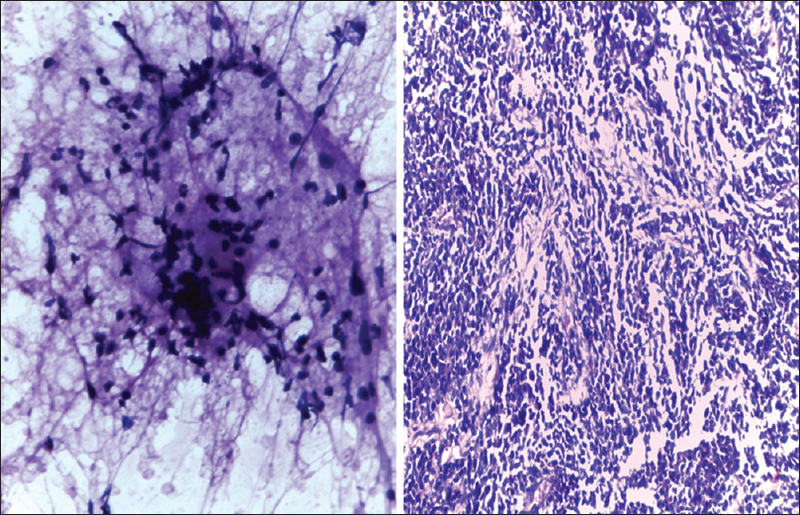 A single case of alveolar rhabdomyosarcoma was seen on microscopy, the deeply eosinophilic cytoplasm was readily appreciated and the alveolar pattern was seen on histology [Figure 5]. The clinician's correlation with FNAC and final diagnosis [Table 2] is about 77% accurate. Statistically, using Fisher's exact test [Table 3], there was a significant association between FNAC and final histology diagnosis (Fisher's exact test = 31.05, P = 0.04). However, no such significant association was found between FNAC and clinicians diagnosis [Table 4], Fisher's exact test = 29–10, P = 0.59. In Nigeria, studies on FNAC correlation with histological diagnosis were mostly done on a single organ mostly on the breast. In a 5-year retrospective study correlation of FNAC and histology for palpable breast masses by Daramola et al. in Lagos, they concluded that breast FNACs compare very well with histology of excision biopsies and in experienced hands are extremely useful in the management of breast lumps. This is in keeping with an earlier study by Mohammed et al. in Kano who showed that FNAC has high diagnostic accuracy and correlates very well with histological diagnosed palpable breast lesions. This study had some limitations. Firstly, the small number of patients we had in this study was mainly due to the fact that we lost some patients to follow up and some declined surgery. Secondly, we had no ancillary techniques such as cell blocks, flow cytometry, FISH, and NGS facilities that could have helped the pathologist in narrowing the differentials for a more definitive diagnosis, especially in the lymphoid tumors. In conclusion. This study has shown that FNAC is a very reliable and efficient procedure in the initial diagnosis of some cancers and that it correlates very well with histological diagnosis. However, care must be given to cellular details, pattern recognition and experience in interpreting FNAC results. Ferlay J, Soerjomataram I, Ervik M, Dikshit R, Eser S, Mathers C, et al. GLOBOCAN 2012 v1.0, Cancer Incidence and Mortality Worldwide: IARC Cancer Base No. 11. Lyon, France: International Agency for Research on Cancer; 2013. Gelband H, Sankaranarayanan R, Gauvreau CL, Horton S, Anderson BO, Bray F, et al. Costs, affordability, and feasibility of an essential package of cancer control interventions in low-income and middle-income countries: Key messages from disease control priorities, 3rd edition. Lancet 2016;387:2133-44. Duijm LE, Groenewoud JH, Roumen RM, de Koning HJ, Plaisier ML, Fracheboud J, et al. A decade of breast cancer screening in the Netherlands: Trends in the preoperative diagnosis of breast cancer. Breast Cancer Res Treat 2007;106:113-9. Oyama T, Koibuchi Y, McKee G. Core needle biopsy (CNB) as a diagnostic method for breast lesions: Comparison with fine needle aspiration cytology (FNA). Breast Cancer 2004;11:339-42. Berner A, Davidson B, Sigstad E, Risberg B. Fine-needle aspiration cytology vs. core biopsy in the diagnosis of breast lesions. Diagn Cytopathol 2003;29:344-8. 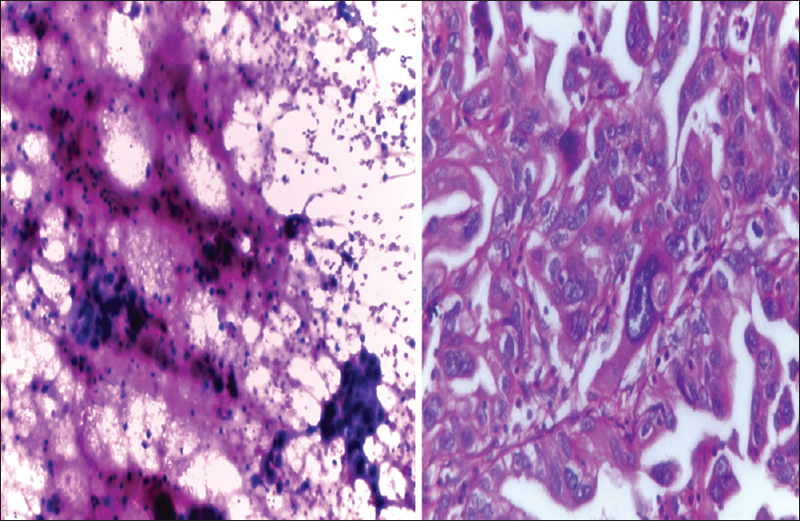 Pilgrim S, Ravichandran D. Fine needle aspiration cytology as an adjunct to core biopsy in the assessment of symptomatic breast carcinoma. Breast 2005;14:411-4. Panjvani SI, Parikh BJ, Parikh SB, Chaudhari BR, Patel KK, Gupta GS, et al. Utility of fine needle aspiration cytology in the evaluation of breast lesions. J Clin Diagn Res 2013;7:2777-9. Basnet S, Talwar OP. Role of cell block preparation in neoplastic lesions. J Pathol Nepal 2012;2:272-6. Manfrin E, Mariotto R, Remo A, Reghellin D, Falsirollo F, Dalfior D, et al. Benign breast lesions at risk of developing cancer – A challenging problem in breast cancer screening programs: Five years' experience of the breast cancer screening program in Verona (1999-2004). Cancer 2009;115:499-507. Sang-Mo P, Dong-Wha L, So-Young J, Dong-Won K, Yoon-Mi J, In-Ho C. Fine- needle aspiration cytology as the first pathological diagnostic modality in breast lesions: A comparison with core needle biopsy. Basic Appl Pathol 2010;3:1-6. Singh VB, Gupta N, Nijhawan R, Srinivasan R, Suri V, Rajwanshi A, et al. Liquid-based cytology versus conventional cytology for evaluation of cervical pap smears: Experience from the first 1000 split samples. Indian J Pathol Microbiol 2015;58:17-21. Abba AA, Bamgboye AE, Afzal M, Rahmatullah RA. Lymphadenopathy in adults. A clinicopathological analysis. Saudi Med J 2002;23:282-6. World Health Organization. WHO Report Global TB control: Nigeria. In: WHO, editor. Geneva, Switzerland: WHO; 2017. Available from: http:/www.who.int/ global atlas/predefined Reports/TB/PDF_Files/nga.pdf. [Last accessed on 2017]. Burkitt D. A sarcoma involving the jaws in African children. Br J Surg 1958;46:218-23. Troxell ML, Bangs CD, Cherry AM, Natkunam Y, Kong CS. Cytologic diagnosis of burkitt lymphoma. Cancer 2005;105:310-8. Vestito A, Mangieri FF, Gatta G, Moschetta M, Turi B, Ancona A, et al. Breast carcinoma in elderly women. Our experience. G Chir 2011;32:411-6. Hatada T, Ishii H, Ichii S, Okada K, Fujiwara Y, Yamamura T, et al. Diagnostic value of ultrasound-guided fine-needle aspiration biopsy, core-needle biopsy, and evaluation of combined use in the diagnosis of breast lesions. J Am Coll Surg 2000;190:299-303. Daramola AO, Odubanjo MO, Obiajulu FJ, Ikeri NZ, Banjo AA. Correlation between fine-needle aspiration cytology and histology for palpable breast masses in a Nigerian tertiary health institution. Int J Breast Cancer 2015;2015:742573. Mohammed AZ, Edino ST, Ochicha O, Alhassan SU. Value of fine needle aspiration biopsy in preoperative diagnosis of palpable breast lumps in resource- poor countries: A Nigerian experience. Ann Afr Med 2005;4:19-22.